In May of 2000, my friends and I were out walking on an early evening. My friend, Dave, wanted to go to the cemetery just for fun; we wanted to get spooked, I guess. So we agreed. We went through all the graves and I found it creepy and felt as if someone was watching me from far away. So I looked behind me and I thought I saw someone hiding behind a tree, but I thought my mind was playing tricks on me, so I didn’t say anything. My friends were gathered around a tombstone; they found it interesting because it had some markings on it. Me and my friend, Rachel, went on to wander around when all of a sudden we heard someone crying out in the woods. We decided to go out and see what was going on. We were half way into the woods when my friends saw something behind a bush. She was scared to go see what it was. 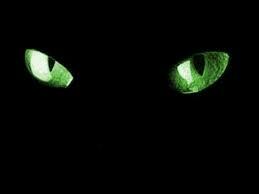 So I went first and as I was walking I saw two green eyes looking right at me! I just started screaming and I grabbed my friend, who was petrified, and we ran all the way back to the car. My other friends were still out in the cemetery and we quickly called them over to the car. I said that something dangerous was out in the woods and they quickly ran to the car and we sped away. While we were in the car, me and Rachel explained to them what happened. All of a sudden, we halted. My friend who was driving saw the exact green eyes I saw in the forest right up by a tree we had passed! To this day we still don’t know what was out there. The very next day, we called the police and they didn’t find anything. Home » Your True Encounters » May 2015 » Something Dangerous in the Woods?